It's no secret that director James Gunn's cosmic adventure Guardians of the Galaxy features an appearance by Thanos, since Marvel announced in May that Josh Brolin is playing the Mad Titan. Since Thanos was revealed during the end credit sequence in Marvel's The Avengers, many fans have wondered if Guardians of the Galaxy will set the stage for a possible Guardians/Avengers crossover. 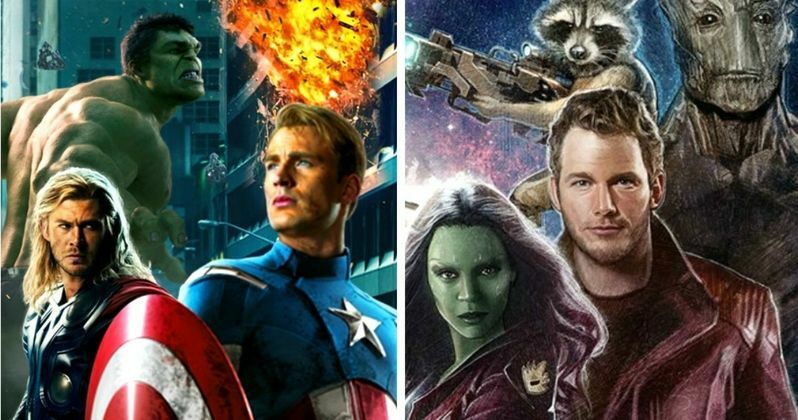 During an interview with Digital Spy, James Gunn hinted that there is a "decent chance" that the Guardians and the Avengers will cross paths. "I think that there's certainly a decent chance that in the near future some of the Avengers or some of the Avengers or the Guardians AND the Avengers or some sort of permutation of that, they'll meet at some point in time." While it's too soon to tell whether or not a Guardians of the Galaxy sequel will get the green light at Marvel, the filmmaker already revealed that he will be back to direct a follow-up, if this first movie proves to be a hit. The director stated that he has always been thinking about doing a second movie, while planning the first. "I've been thinking about a sequel from the beginning. When I was setting up Guardians, I wanted it to be a movie that worked by itself, but also wanted to set up a whole galaxy of characters that we could play with in different ways. I have tons of ideas of things we can do, but we'll just have to see how things go..."
Would you like to see a Guardians/Avengers crossover? Chime in with your thoughts below.